More acres are devoted to growing peanuts in the US than to any fruit, any vegetable, or any nut (peanuts are legumes, like beans or peas). How it’s grown really can make a difference. 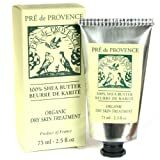 Pre de Provence 100% Organic Shea Butter 2.5 oz / 75ml tube. Imported From France. All-natural shea butter, vegetable based, no colorants. Organic, pure shea butter brings the finest of nature’s emollients directly to your skin. Nothing stands between you and the tender, soothing touch of 100% pure shea butter! Triple milled for surpassing smoothness. Lovingly blended with the richness of shea butter. No animal testing was involved in the development and production of this product. Manufactured in France exclusively for Pre de Provence. Formulated with olive oil and olive butter, the Cucina Nourishing Hand Butter nourishes and moisturizes a chef’s damaged hands. A regenerating treatment that leaves a protective film on your hands. Use as intensive care to prevent your skin from aging and help restore its natural lipid layer. Signifying ”kitchen” in Italian, Cucina literally fills your kitchen with the delectable scent of fresh cut aromatic herbs! CUCINA’s Nourishing Hand Butter combines all the benefits of the olive tree. Its first cold olive oil deeply moisturizes hands dried out from frequent washing, while its olive leaf extracts stimulate the skin and help heal minor cuts and burns.